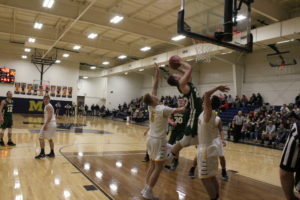 Moorefield held the lead for a mere seven seconds the entire game, while the Rams ransacked the Hive for a 59-34 victory on Saturday. 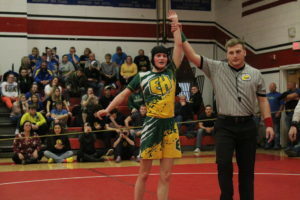 This was in stark comparison to the 54-50 win Strasburg made back home in Virginia against the Yellow Jackets during the second game of the season. It was an ominous start as the ball slipped through the fingertips of Garett Haggerty during Moorefield’s initial possession. Strasburg’s Justin King snatched a rebound and was fouled by Blake Watts which led to a pair of free throws for a 2-nil edge at the 7:05 mark. 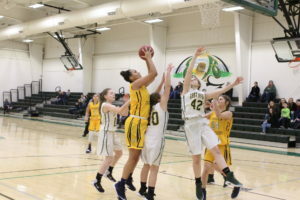 After a Rams foul, Haggerty sliced through the defense along the baseline leaping up for what potentially could have been a dunk and instead softly lifted the ball into the hoop to tie the game at the 6:25 mark. Haggerty made defensive rebound, then broke a baseline trap and passed to Brent Moran, who was forced to step out of bounds for a turnover. Watts collected a defensive board, then passed to Chase Vance, who tossed to Haggerty and a foul was assessed on the drive to the basket and one free throw was added to give Moorefield its one and only lead at 5:14, 3-2. Strasburg’s Austin Miller grabbed the rebound off the charity stripe attempt, then launched a pass to Stephen Kloosterman for a 3-pointer as the Rams regained the lead at 5:07, 5-3. Moran cut across the paint for a layup to knot the contest at 4:47, but that was the closest the Yellow Jackets would get without taking a lead the remainder of the game. Vance collected a defensive rebound, then Kloosterman did the same for the Rams before losing the ball out of bounds. 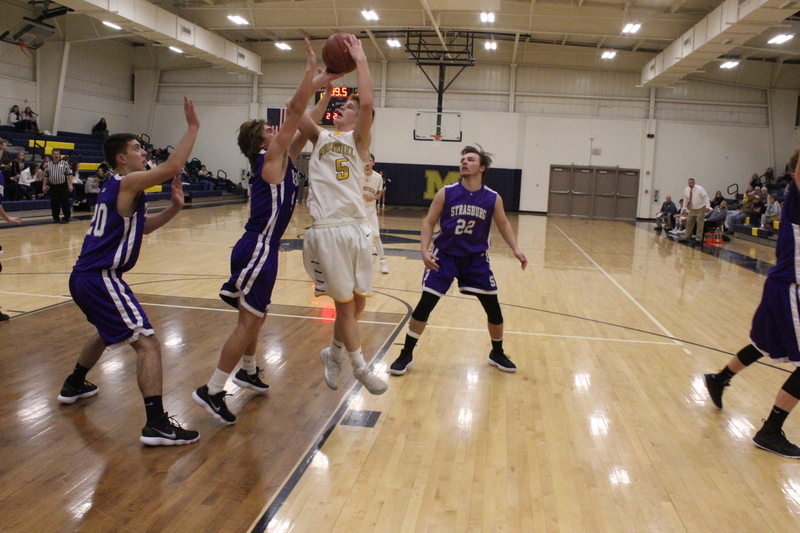 A shot by Moorefield hit the rim and ricocheted out of play. King cut inside the paint for a basket to give Strasburg the lead for good at 3:22, 7-5.